Relay to decvaxlharpolnpoisihouxi!houxc!ad7i and or Hank Magnuski but there is a brain damaged mailer somewhere so hope this works. I found some things that I think are really bad in your header format. 1) The FROM and TO fields are backwards. Why make your node filter through the FROM field first. You can more quickly determine if it is your packet if the TO field is first. 2) Remove all, underscore, bold italics control information from the header. Why would any node want to know about that? It really simplifies the code of the repeater node if it only has to resend the info. If the control info was encapsulated in the information field, the consenting packeteers would be able to strip that out of the info field. Why clutter up that level with useless information. Makes more sense to me to put protocols in the info field, that way you can experiment with new, improved protocols in the information field without confusing your repeater/gateway nodes in the interim. 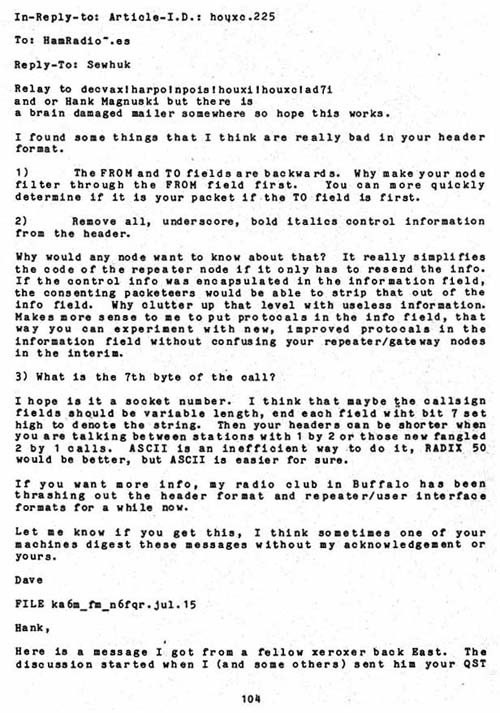 3) What is the 7th byte of the call? I hope is it a socket number. I think that maybe the callsign fields should be variable length, end each field with bit 7 set high to denote the string. Then your headers can be shorter when you are talking between stations with 1 by 2 or those new fangled 2 by 1 calls. ASCII is an inefficient way to do it, RADIX 50 would be better, but ASCII is easier for sure. If you want more info, my radio club in Buffalo has been thrashing out the header format and repeater/user interface formats for a while now. Let me know if you get this, I think sometimes one of your machines digest these messages without my acknowledgement or yours.